The market for third-party logistics services continues to expand and evolve in response to market demands and a changing competitive landscape. And nowhere are these trends more evident than on this year’s Transport Topics Top 50 list of the largest logistics companies in North America. year since TT published the first Top 50 list in 2002. J.B. Hunt Transport Services, a trucking company turned intermodal giant, moved into the No. 2 spot after lining up third behind UPS and XPO in 2016. Jacobs achieved the goal of creating a multibillion-dollar logistics services provider by buying up more than two dozen logistics firms, including some of the largest players in the market, and now is working to integrate those operations to begin generating sustainable profits. 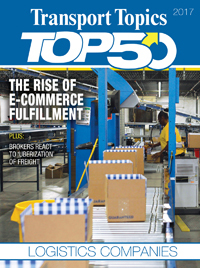 XPO’s rise to the top isn’t the only noteworthy change on this year’s TT logistics 50. The growth of e-commerce is giving rise to a new kind of logistics business that combines elements of warehousing and distribution and transportation management to fulfill orders for goods purchased online, and is the subject of an in-depth story by Senior Features Writer Daniel P. Bearth. Two companies that specialize in e-commerce fulfillment, Radial and Ingram Micro Commerce & Fulfillment Solutions, are represented on the TT logistics 50 at Nos. 23 and 34, respectively. A complete list, plus expanded listings of freight brokerage and warehousing firms, dedicated contract carriers and airfreight and ocean freight forwarders, can be found here. The TT logistics 50 list is one four special publications produced by Transport Topics each year. TT also will publish the Top 100 for-hire carriers list, the Top 100 private carriers list and Top 50 global freight carriers lists later this year.